A broad cultural movement that is networked, open source, and collaborative is challenging, and sometimes replacing, key elements of the traditional nation state. The result could be characterized as a dispersed but coherent digital nation, a polity with its own rules, identity, origin myth, politics, currency, education system, and hierarchy. The established political order struggles to absorb these challenges, sometimes shutting them out, sometimes trying to co-opt them. When veteran broadcaster Jon Snow last week said it was “hard to imagine anyone of sound mind who doesn’t hope that Edward Snowden stays free,” he was echoing a consensus that had emerged online, that Snowden had acted in the public interest. This week in a very different arena, a very different consensus emerged, almost no nation state wants to welcome in the fugitive. Daniel Drezen is the first person I’ve seen address this split consensus directly, and his explanation is simple: Snowden’s actions threaten “the Westphalian order,” the political status quo. That order is threatened elsewhere. 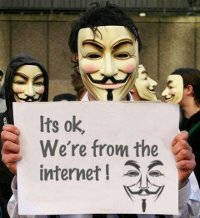 Internet-fuelled tensions are seen in government, the media, the arts, education, industry, science, all separately emergent and distinct, but visibly coherent. Bruno Latour calls it the “pixellation of politics,” but as the pixels grow they eventually form an image, a broad cultural movement. Snowden, with his team of Wikileaks lawyers, sponsored by hackers via Bitcoin, is part of a wider cultural movement that is threatening the very concept of a nation state. The nation state is a relatively recent creation, and comes in a variety of flavours. In general it involves a political and cultural body built on collective identity, which itself comes from shared culture, history, language, religion, territory, ethnicity, or ideals. As Benedict Andersen describes in “Imagined Communities,” the shared experiences that makes national identity possible were first propagated with the help of the printing press, the enlightenment, and capitalism. Others have argued that new mapping techniques were also important. We could generalize this and say the nation state was borne of expanding technology and knowledge. So as the digital era matures, the corpus of technology and knowledge is still expanding, accelerated by the Internet, and that which created the nation state now appears to threaten its future. The writer Bonnie Greer characterises this as a generational change. She describes Snowden et al as libertarian millenials, who are “apolitical, perhaps even post-political,” and who “do what they do because they have come to their own conclusions in their own time and in their own way.” I think there’s more to this than generational tension and resentment of the state, being a fully immersed members of networked society brings with it an identity. As John Perry Barlow wrote in the his call for an independent online polity, “you are terrified of your own children, since they are natives in a world where you will always be immigrants.” Libertarian Millenials are just one faction in a wider of community of natives in a digital nation, all of whom are of the Internet, from the Internet. In his 2008 book Viral Spiral, David Bollier describes how netizens have built a “digital republic” with a “new species of citizenship.” The phenomenon is almost entirely built around the Internet, a space which (he argues) propagates creativity, innovation, and democratic culture. Digital citizenship is most visible in the problems it causes for terrestrial governments. People are online and offline, but they prefer the open rules, efficiency, and goodwill of online life, and their expectations of offline institutions change. The result has been a transnational cultural movement that embraces technology, transparency, and collaboration, and in the process replaces institutions with networks. 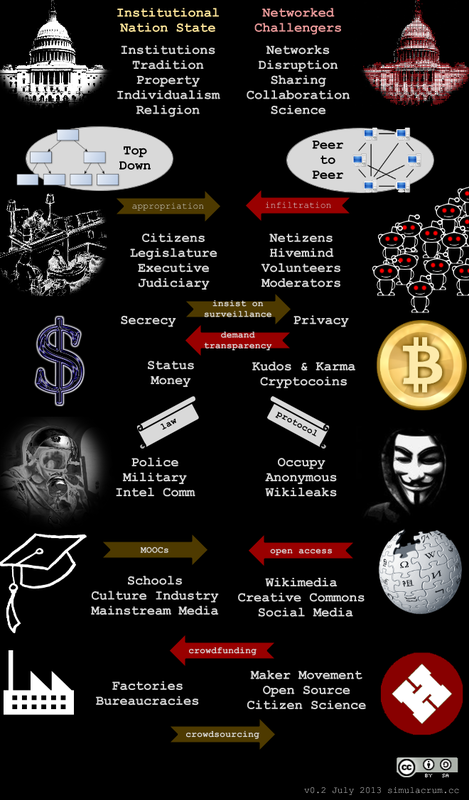 The core of this movement has been visible in the form of Anonymous, Wikileaks, Occupy, and if we wanted to cast the net wider we might include Wikipedia, open source software, and maker/hackspace culture. It has its roots in cypherpunk idealism, such as McKenzie Wark’s call to arms for the “hacker class,” but includes a number of other factions, each with a different set of priorities. There has long been a community of people keen to build a digital citizenship, as part of “a civilization of the Mind in Cyberspace.” As I’ve argued before, that claim is far more credible now that they have their own currency, Bitcoin. This got me thinking, if Bitcoin is the digital dollar, where else can we find direct equivalence between the traditional order and disruptive online forces? The answer is…everywhere! So I did what any self-respecting netizen does and made a simple infographic. One of the things I quickly realised is that there is a constant back and forth between the terrestrial nation and its networked challengers. Established elites try to harness and appropriate the efficiencies of digital practices, and conversely digital communities try to infiltrate the old order. When the two worlds collide, such as with free online courses run by Ivy League universities, it’s often unclear what kind of an exchange is taking place, and this ambiguity may hint at a weakness in the model. Nonetheless, here is the analogue nation its digital, networked equivalent nation side by side, as I conceive them. Feedback is welcome. Originally I was talking in terms of a “digital nation,” but to imagine that old institutions will be swept away by networked replacements is to ignore centuries of dialectic change in governance. I also don’t think this phenomenon is wholly digital, as anyone who has visited a hackspace will testify, and any digital polity would continue to rely on the physical infrastructure sponsored and organised by its institutional predecessors. In the spirit of that which it describes, this chart is open source and open to collaboration. I haven’t broached the role of some of the more ambiguous players. For example, Facebook is highly centralized and institutional, but allows network behaviour to flourish. Likewise the community of Pirate Parties is heavily networked, but operates within an institutional framework to pursue its goals. I would have liked to include more on BitTorrent and other P2P protocols, but I’m not sure where to find equivalence in the old order. I’ll leave the Google Drawing open here if anyone wants to play with it.